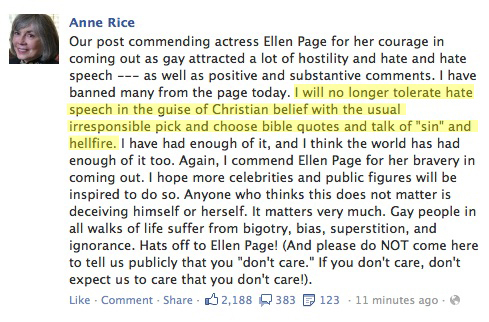 I saw this today on Anne Rice’s Facebook page. I don’t read fiction that often (except for religious books), but I think Anne Rice is beautiful. This entry was posted in Atheism and tagged Atheism, bible, bible quotes, Christianity, Christians, Ellen Page, Gay marriage, Gay rights, God, Jesus, Religion, the bible. Bookmark the permalink.